This white bean chicken chili is made very special with Swiss Chard and lots of Italian flavors. The combination makes for a great bowl of chili. This just may be the best White Bean Chili I’ve ever had – EVER! The odd combination of the flavors march right up the aisle, all the way to the altar, and to everyone’s surprise, and without much ceremony, join in holy matrimony. Giada served this up a couple of months ago on Giada at Home. I went to foodnetwork.com, bookmarked the recipe and vowed to give it a try. First of all, I’ve never seen chard in a White Chili recipe, nor have I seen Parmesan Cheese. But they seemed happy, so who am I to judge. 2nd of all, Chard is about the most beautiful vegetable to prepare. Those deep rich green leaves with the red veins and those luscious colored stalks. It just makes me feel good about adding it. I think my New Year’s Resolution might be to get to know Chard a bit better. Plus I must say that this Fall I froze a lot of delicious fresh Colorado sweet corn, cutting the kernels off the cob and saving them for special occasions such as this. The only thing I changed with this recipe was to garnish with cilantro instead of parsley. Yum either way. Enjoy! We truly thought this was the best white bean chicken chili we’ve had. 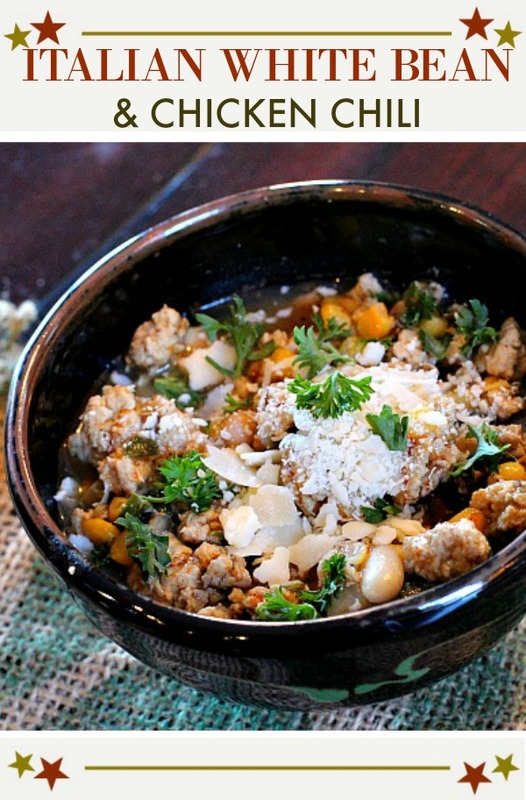 I hope you give this white bean chicken chili recipe a try. And if you do, please come back and let me know how you liked it and give the recipe a star rating. Your feedback is valuable to me for developing future recipes. And if you have a favorite white chicken chili recipe, let me know, I’d love to give it a try. In a large heavy-bottomed saucepan or Dutch oven, heat the oil over medium-high heat. Add the onion and cook until translucent, about 5 minutes. Add the garlic and cook for 30 seconds. Add the ground chicken, 1 teaspoon salt, cumin, fennel seeds, oregano, and chili powder. Cook, stirring frequently, until the chicken is cooked through, about 8 minutes. Stir the flour into the chicken mixture. Add the beans, Swiss chard, corn, and chicken stock. Bring the mixture to a simmer, scraping up the brown bits that cling to the bottom of the pan with a wooden spoon. Simmer for 55-60 minutes until the liquid has reduced by about half and the chili has thickened. Add the red pepper flakes and simmer for another 10 minutes. Season with salt and pepper, to taste. This sounds so good – I love the spices. Chard grows well up here in Montana and I usually freeze some at the end of summer. What a great winter use. I am adding this to my soup recipes. Very nice post – you made me grin (as usual). Thanks for stopping by NQN. I think I’ve never met a chili I didn’t like, unless it just too doggone hot. I make a Wicked White Chili that has 4 1st place trophies, and was in the local( not a chili cook off either!) newspaper for third in a city wide cook off.. If you want the recipe, E-mail me! Key ingredients- cooked cubed chix breast, sweet Italian sausage, Jalapenos, and Alfredo sauce..
Hi – I’d be very interested in seeing your chicken chili recipe. That looks really good. I’ve never found a great white chili – I am going to try this soon! Sounds wonderful! I love Giada, I will have to try this soon. Giada rocks my world! I’ve never been disappointed with any of her recipes. Thanks for stopping by. I agree, I’ve saved so many of her recipes. Have only made a few and they are delicious. I love white bean chili. I’ll be giving this recipe a try! I never would have thought to make an Italian version of chili, but I trust Giada implicitly. And you. These pictures are beautiful! What a great presentation. I agree Joanne. She’s got great recipes. As always, thanks for stopping by. Such a great and unique combination of ingredients, you have to love Giada. Thanks for joining us at Souper Sunday this week! The round-up is now posted. I love Souper Sunday. Thanks for stopping by Deb.